I created the card using retired CTMH paper. I have always liked this paper and may have hoarded it for some time. 🙂 I guess it is time to create with it. As St. Patrick’s Day is upon us, I decided to pull the paper out and make a card. I am submitting this card to the Heart 2 Heart Going Green challenge. Happy crafting. It’s great that you were able to use some of the CTMH retired papers…that’s always fun to do. 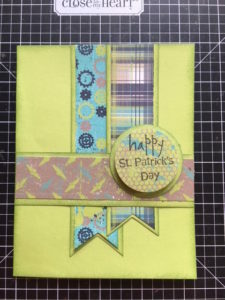 Colorful and fun card for St. Patty’s Day. Please come back and join some of our other theme challenges this month and become an Addict and earn a Perfect Attendence Badge. Great card and I have hoarded that paper too! Thanks for joining us at Heart 2 Heart! Great card, thanks for sharing at H2H. A throwback with some fun papers! FUN! Great card, I love the colours, super cute! Thanks for playing along with Heart 2 Heart Challenges (H2H).